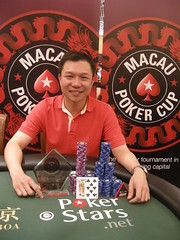 Pokerkaki.com congratulates kakis Ricky Foo(aka rickyfoo) and Daniel Chua(aka eRaiser) for doing themselves proud at Event 5 of the recently concluded Macau Cup. Event 5 defending champion Ricky Foo continued his solid string of Macau Cup performances by bagging 8th spot in a tough field, before running his short stacked A2 all-in preflop into his opponent’s pocket Jacks. For yet another credible run on the felt, Ricky picked up HKD$6,800 for his efforts.